As you may have noticed, Mario Kart 8 arrives for Wii U today. This much-ballyhooed racer is regarded as one of the floundering console’s big hopes, the kind of release (alongside the upcoming Smash Bros) that can actually sell the darn thing. With that in mind, let’s party like it’s 1992 and pay homage to the game that started it all. Super Mario Kart hit the SNES that year, and was really quite an odd notion at the time. After all, Mario, Luigi, Bowser et al were quite happy in their natural home: platform games. In one of those out-of-the-blue moves Nintendo would become known for, here they suddenly were in a toontastic racer. These were the days before all manner of oddities entered the roster (Super Mario Galaxy’s Honey Queen, Petey Piranha and those darn Miis have all been playable in recent entries). It was a ‘pure’ Mario Kart in many respects, bringing us just the eight core racers: Mario, Luigi, Peach, Toad, Yoshi, Koopa Troopa, Bowser and Donkey Kong. Only our hairy monkey friend was a bit of an anomaly, this actually being D.K Jr. You can tell by that old Die Hard vest he’s wearing. Presumably, these were the days before gorillas earned the right to stride about naked as nature intended. Ah yes. These were the days. Anywho, so many aspects of the series were firmly in place from the get-go. The singleplayer options, Grand Prix and Time Trial, are Mario Kart mainstays. In the first, you’ll select a character and race the remaining cast across a sequence of four tracks. You score points according to your placement on each course, and the cup is awarded at the end. Meanwhile, Time Trial sees you cruising along the track of your choice on your own, in a bid to achieve the fastest time. You’re surely familiar with the multiplayer modes too. The iconic Battle Mode was introduced here, and has returned in some form or another in every later installment. It’s that ancient, noble sport: just you, your opponents, a large arena, and some… brightly coloured balloons. It’s all very manly. 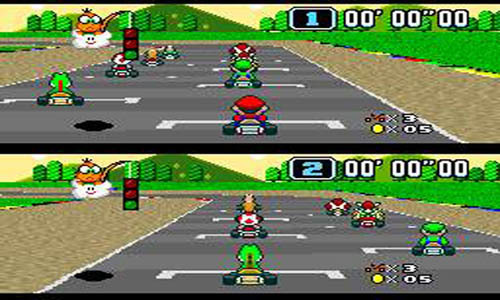 Super Mario Kart made liberal use of the SNES’s fancy Mode 7 effect. 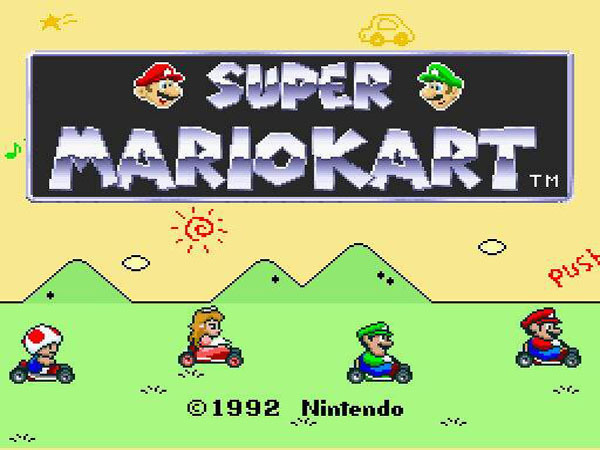 This screen-rotatey wizardry gave the game its vibrant visuals and that sensation of movement, and coupled with the jangly music, the Mario Kart magic was born. So many kart racers arrived in its wake. From Crash Bandicoot to the Crazy-freaking-Frog, everyone wanted to get in on the action. It’s undeniable, though, that this was the game that set the template for the genre. Item boxes, weight classes, even most elements of the HUD were shamelessly aped. Of the many pretenders, so few could even hold a candle to the original (although Crash Team Racing was fantastic). It was surely the familiar characters themselves, and the Mario-fied tracks, but none could really complete.